The Rwandan Diaspora Australia and the Asia Pacific Centre for the Responsibility to Protect invite you to attend a public seminar and commemoration event marking 25 years since this human tragedy. This year is an important milestone in the fight against genocide ideology for the Rwandan community and we are honoured to have Ms Assumpta Mugiraneza, co-founder and director of Iriba Centre, Rwanda to present on social reconstruction and reconciliation. Professor Alex Bellamy, Director of the Asia Pacific Centre for the Responsibility to Protect will provide an overview of the current and emerging regional and global issues. We welcome our 2019 R2P Student coalition executive and members and all other students interested in R2P, Atrocity Prevention and human rights. 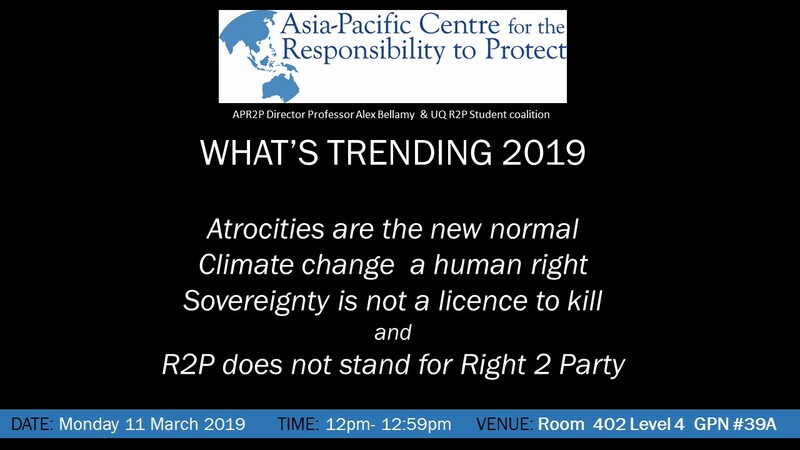 For more information contact R2P Student Coalition stand on UQ Market Day( Great Court, 20th Feb 2019 ) or at r2pstudentcoalition@gmail.com or on Responsibility Student Coalition on Facebook. Join the Asia Pacific Centre for the Responsibility to Protect as we Q&A with Dr Simon Adams, Executive Director Global Centre for the Responsibility to Protect. In collaboration with the United National Association of Australia Queensland Division, the Asia Pacific Centre for the Responsibility to Protect invites you to celebrate and critically reflect on the 70th anniversary of the Universal Declaration of Human Rights with Professor Alex Bellamy Director of the Asia Pacific Centre for the Responsibility to Protect and other leading brisbane based human righst advocates. Date: Tuesday, 9th October 2018. Time: 5:00 - 6.15 pm. Venue: Terrace Room, Sir Llew Edwards Building (Building #14), St Lucia campus, The University of Queensland. Please join APR2P in welcoming Martin Mennecke, Associate Professor of International Law at the University of Southern Denmark. Martin is an adviser to the Danish Ministry of Foreign Affairs in meetings with the European Union, the United Nations, the International Whaling Commission and the International Criminal Court. For the past six years he has been an adviser to the Danish R2P Focal Point at the Ministry of Foreign Affairs and has helped to facilitate the implementation of R2P across the Danish government. He has also worked with the Ministry's Human Rights Department, the development cooperation team (DANIDA), the Ministry of Defence and relevant Embassies. Date: Monday, 10 September 2018. Time: 12 noon - 12:50. Venue: Room 402, General Purpose North Building (#39A), St Lucia campus, The University of Queensland. 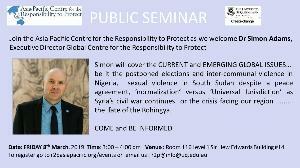 Please join us for a public seminar with Dr Simon Adams, Executive Director Global Centre for the Responsibility to Protect, entitled "'If Not Now, When? ': The Responsibility to Protect, the Fate of the Rohingya and the Future of Human Rights". Date: Thursday, 26 July 2018. In collaboration with The Queensland Jewish Board of Deputies, the Asia Pacific Centre for the Responsibility to Protect invites you to the 2018 Holocaust Day of Remembrance - Yom HaShoah. The ceremony will honour those who died during the Holocaust and offers a unique opportunity to hear a survivor's story of hope and strength. Date: Wednesday, 11 April 2018. RSVP: Registration is essential to attend. For more information, email r2pinfo@uq.edu.au. In collaboration with the Rwandan Diaspora of Australia, the Asia Pacific Centre for the Responsibility to Protect would like to invite you to commemorate the lives that were lost and to show solidarity for the survivors of the Rwandan genocide. 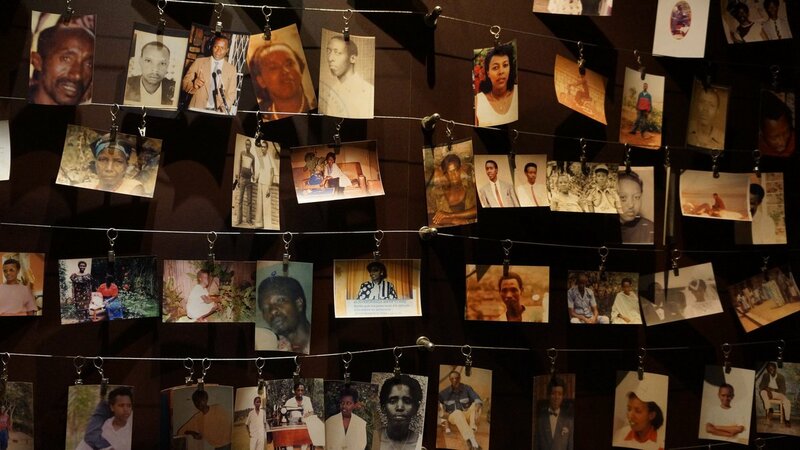 Over a period of 100 days in April 1994, more than a million of Rwandans were innocently slaughtered during the genocide against Tutsis and their Hutu sympathisers. This is the 24th year since that sad human tragedy. Special guest High Commissioner H.E Guillaume Kavaruganda for the Republic of Rwanda in Australia and members and friends of the Rwandan Diaspora of Australia will share their journeys of resilience and courage. Date: Saturday, 7 April 2018. Venue: 2 Wineglass Drive, Hillcrest, Brisbane. RSVP: It is essential to RSVP to this event. Email: r2pinfo@uq.edu.au. APR2P alongside the T.C. Beirne School of Law are pleased to cohost the International Association of Genocide Scholars (IAGS) thirteenth meeting on the theme “Justice and the Prevention of Genocide”. Nearly seven decades after the United Nations General Assembly adopted the Convention on the Prevention and Punishment of the Crime of Genocide, the hopes embedded in that document remain largely unfulfilled. The theme of the 2017 IAGS conference revisits the two core components of the Convention: justice for acts of genocide, and prevention of future genocides. 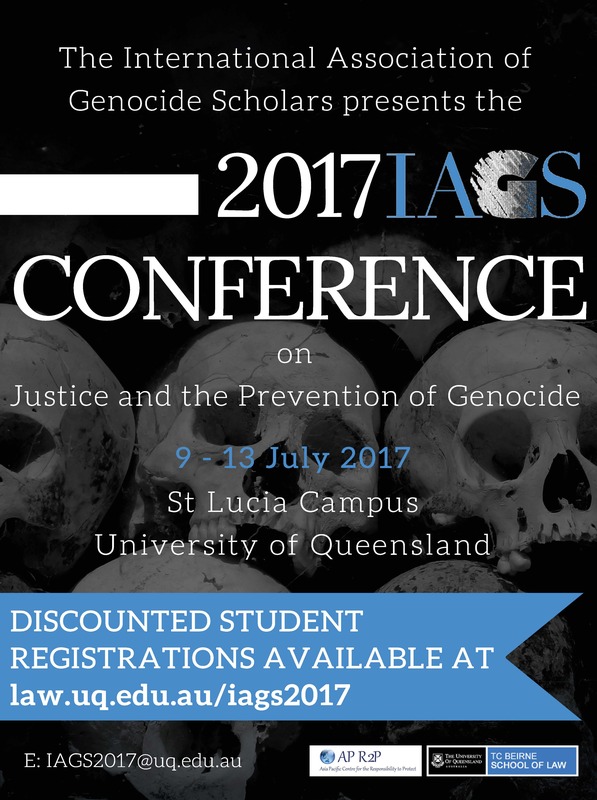 While the conference theme will concentrate on these twin themes of justice and prevention, the 2017 IAGS conference is open to any whose work connects with the study of genocide. We aim to bring together scholars, activists, artists and survivors to examine genocidal violence from a wide range of disciplines and approaches. Attendance at the conference is open to all interested academics, professionals and students, but presentations can only be made by members of IAGS. To join IAGS, please visit the association’s website:www.genocidescholars.org/membership. Date: Sunday 9 July - Thursday 13 July 2017. Venue: St Lucia campus, The University of Queensland. RSVP: To register your place and to find more information, see the conference website. Ambassador Pou Sothirak is the Executive Director of the Cambodian Institute for Cooperation and Peace, a leading Cambodian policy think tank established in 1994 after three decades of civil war. 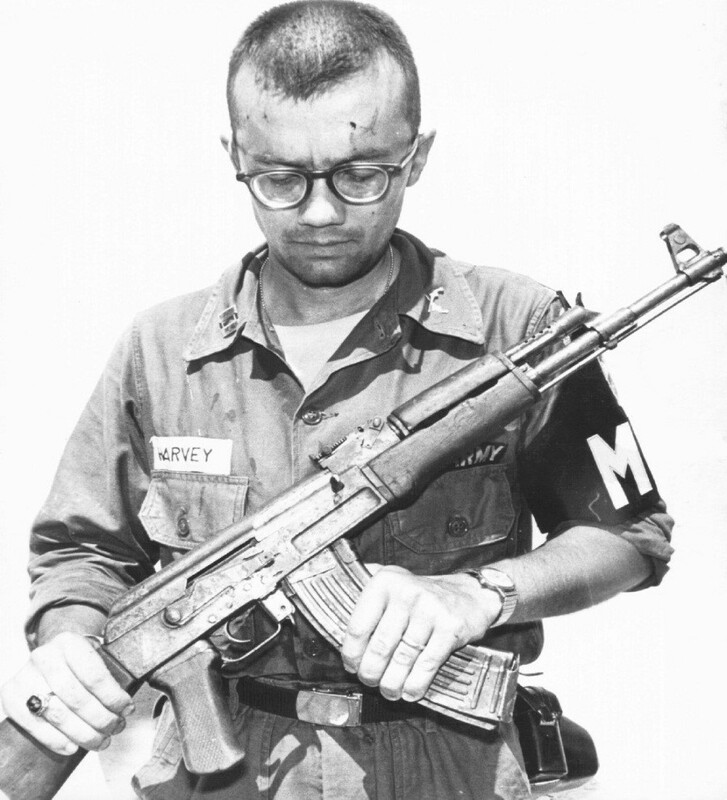 He was born in Phnom Penh, left Cambodia in 1973 to return many years later to work as a Humanitarian Coordinator at one of the refugee camps along the border between Thailand and Cambodia. He was a Member of the Cambodian Parliament, Minister for Industry, Mining and Energy and also the Cambodian Ambassador to Japan. Join the Centre in what shall be a memorable presentation as Ambassador Pou outlines how Cambodia has been preparing itself to deal with past atrocities and discuss some achievements and challenges in dealing with preventing future atrocities. He will also touch on what kind of international assistance Cambodia would need to build capacity in atrocity prevention as well as to take a lead in ASEAN to promote R2P in the Southeast Asia region. Date: Friday, 17 February 2017. Venue: Room 116, Sir Llew Edwards Building (Building #14), St Lucia campus, The University of Queensland. APR2P invites you to a public seminar given by Dr. Anastasia Shesterinina, a Postdoctoral Fellow at Yale University's Program on Order, Conflict and Violence. Dr. Shesterinina's current research focuses on the internal dyanamics of civil war, including fighter mobilisation, armed group organisation, post-war patterns of violence and international intervention in armed conflict. Date: Thursday, 7 July 2016. Venue: Room 209, General Purpose North Building (#39A), St Lucia campus, University of Queensland. This seminar offers an update to the events covered in Spotlight article Issue 20a (see the Myanmar (Burma) section on the R2P in the Asia Pacific page), examining the prospects for democratisation and atrocities prevention in Myanmar. Recent media reports suggest there are many good reasons to be worried about election violence and the credibility of elections. On 8 November 2015, Myanmar held its first multi-party national elections since 2010 where the ruling party USDP and Aung San Suu Kyi's National League for Democracy (NLD) fiercely contested more than 400 seats in the national parliament. Prior to the elections, the NLD and other civil society groups in Myanmar have alleged voter registration problems and harassment during election campaign by supporters of NLD. Disenfranchisement of Rohingya and other minority groups were also reported in the media. What are the prospects for Myanmar's democratic transition following the elections? 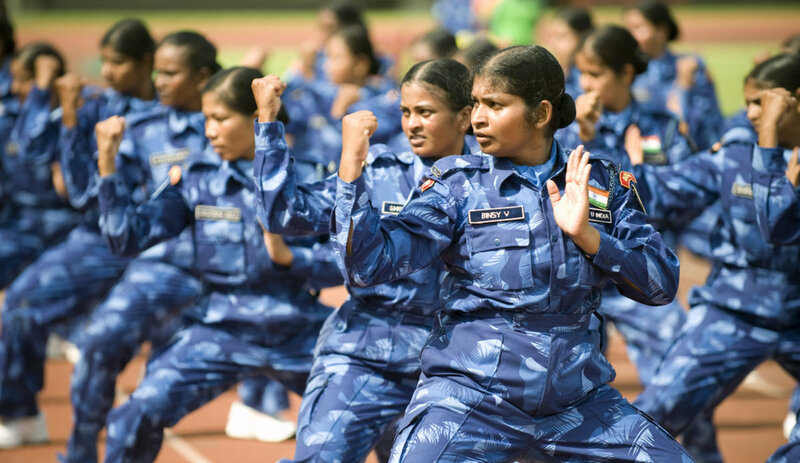 How would the newly elected government respond to continuing challenges to peace and minority protection issues in the country? Would Myanmar continue to pose a problem for ASEAN and its neighbours on the issue of Rohingyas and human trafficking? How should the international community deal with post-2015 Myanmar and what are the prospects for atrocities prevention in the medium term? Join the Centre at this public seminar presented by Dr. Noel Morada, Regional Director at APR2P, to discuss the answers to these questions. Date: Monday, 23 November, 2015. Venue: Room 402, General Purpose North Building (Building #39A), St Lucia campus, The University of Queensland. 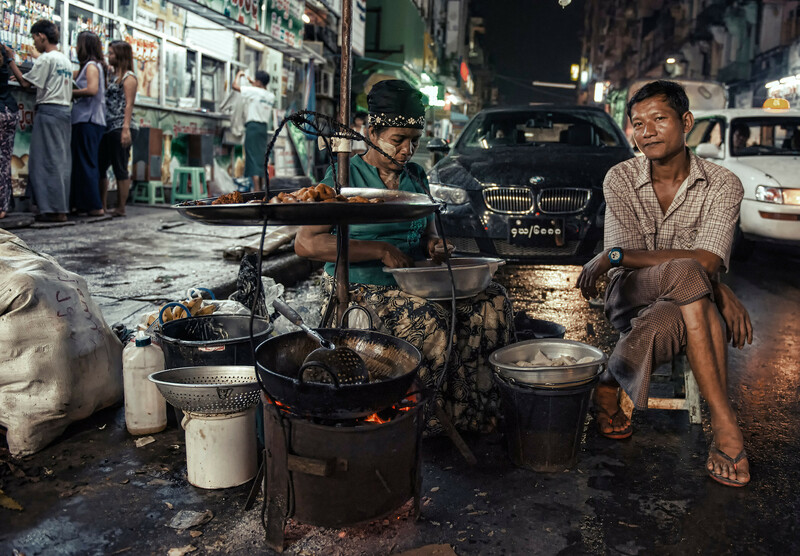 Image credit: Christopher Michel, compfight. Join Dr. Milla Vaha from the University of Turku, Finland, in a seminar co-hosted by the Centre and UQ's School of Political Science and International Studies. In international relations, it is widely recognized that the international order is shaped and organized by Western states and their ideologies. Liberal international political theory permits – and even requires – a distinction to be made between different kinds of states, based on their domestic political structure and ideology. In liberal thought, it could be argued that the liberal democratic form of the state is posited as a universally rational form of political organization. Therefore, this implies that all non-liberal states are by definition, irrational, coercive of their citizens and, respectively, illegitimate. This leads to the differential treatment of states according to their domestic characteristics and special standings in world politics, a position that Gerry Simpson has called ’liberal anti-pluralism’. This presentation will critically examine the acclaimed Kantian heritage of these ‘liberal’ arguments by relying on Kant’s political philosophy that many consider as the ground for liberal international political theory. By doing so, it makes evident that the conclusions liberal exclusionists draw on the supremacy of liberal world order is contradictory to Kant’s ideals of the League of States but, more profoundly, fundamentally illiberal in relation to the key features of liberalism itself. There is an inherent contradiction in liberal thought, between toleration and respect, and autonomy and recognition of the state’s moral agency. This presentation will conclude that in order to be ‘liberal’ in the Kantian sense, liberal exclusionary practices have a need to be carefully re-examined and a discussion on the feasibility of punitive interventions as coercive means by which the Liberal Club may try to enforce the non-liberals to act and behave in a certain manner. Date: Friday, 30 October 2015. Venue: Room 537, General Purpose North Building (Building # 39A), St Lucia campus, The University of Queensland. 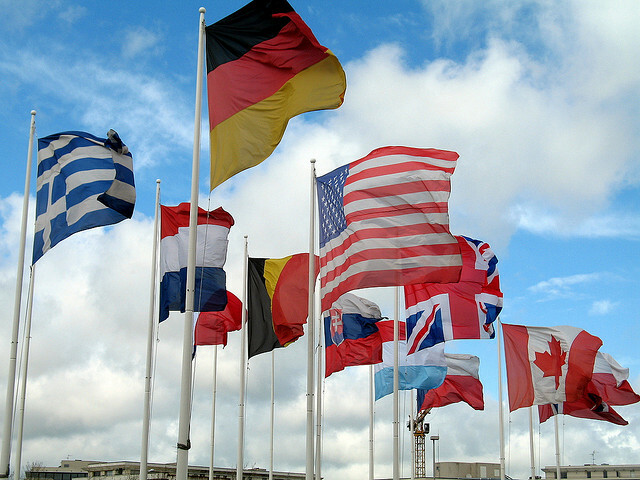 Image credit: International Flags from flickr cc acount, MPD01605. Join us for a roundtable discussion co-hosted by the Centre and UQ's School of Political Science and International Studies. 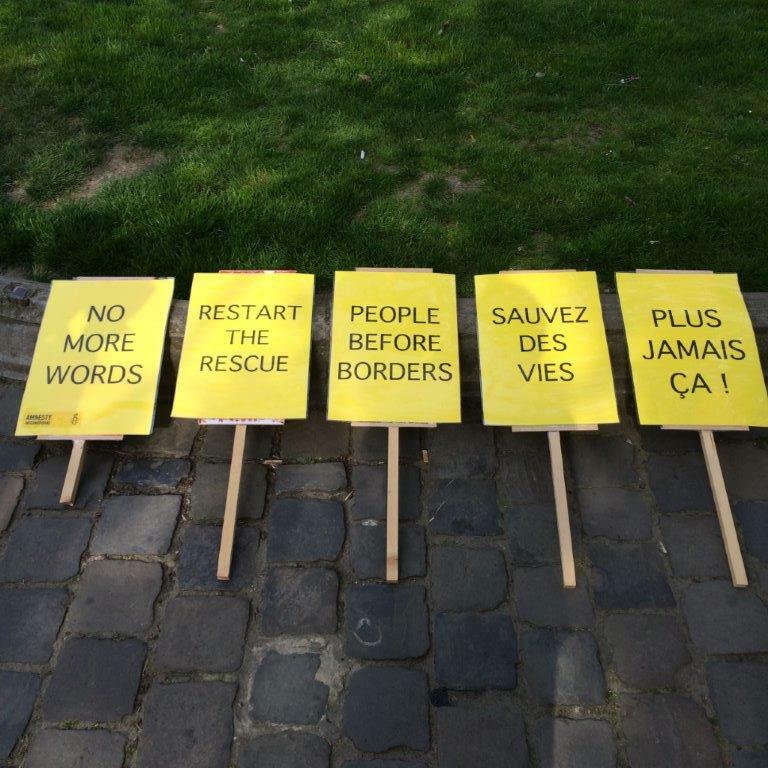 As responsibility for providing protection falls extremely unevenly, public support for the refugee system is undermined. Increasing numbers of refugees are seeking asylum in Europe, and it is clear that it is facing a massive problem of cooperation, with Head of the United Nations High Commission for Refugees (UNHCR), Antonio Guterres, stating that the EU can’t respond to the crisis ‘with a piecemeal or incremental approach.’ However, the emergency is not limited to Europe, and what is needed is clearly a globally coordinated approach. This event brings together experts in the field of refugee studies, international and humanitarian law, and international security in order to discuss the causes of, and possible solutions to, this global emergency. The current refugee emergency taking place in the Mediterranean has put increasing pressure on the international system, not only to protect displaced populations, but also the communities providing protection. Countries that border conflict zones such as Turkey, Lebanon and Jordan have taken in over one million refugees apiece, yet less than one per cent of the world’s total refugee population is ever resettled to a third country through the UNHCR. Date: Tuesday, 13 October 2015. Image credit: Amnesty International flick stream, 2015. Join APR2P Research Fellows Dr. Stephen McLoughlin and Dr. Cecilia Jacob for this public seminar on the concept of state responsibility in Pillar One of the R2P principle. Why are some states are more successful than others in preventing atrocity crimes? International debates on R2P have now shifted from conceptual clarification to implementation, and this research project will provide a timely in-depth study of Pillar One of R2P on state responsibility. Finally, the presentation will discuss preliminary recommendations for states seeking to promote Pillar One through their foreign policy and development assistance. Date: Monday, 12 October, 2015. Join APR2P Director Professor Alex Bellamy for a public seminar that seeks to explain the dramatic decline of mass violence against civilians. From the killing fields of Cambodia to the massacres that accompanied China’s Great Leap Forward and Cultural Revolution, East Asia’s recent past abounds with examples of genocide and mass atrocities against unarmed civilians. Indeed, for much of the Cold War, civilians in East Asia were arguably at greater risk of death by genocide or mass atrocities than civilians anywhere else in the world. Given this history, it is perhaps unsurprising that many commentators in the West view the economic, political and military rise of East Asia with considerable trepidation. Yet practice has a habit of defying expectations. East Asia has been transformed over the past few decades into a zone of relative peace and stability in which acts of genocide and mass atrocity have become quite rare. Whilst the region’s spectacular economic rise, responsible for lifting one billion people out of poverty has been well observed by outsiders, less well understood is the region’s equally dramatic turn away from mass violence against civilians. This presentation attempts to offer some preliminary explanations for this profound change. It argues that four factors in particular account for the region’s transformation towards peace: the accommodation of power and interests, the adoption of the “trading state” model, a multilateral approach to problem-solving and emerging social contracts between states and peoples. Together, these factors explain how the region has been able to manage security dilemmas between states and reshape the relationship between governments and societies within them to significantly reduce the incidence of genocide and mass atrocities. The presentation will conclude by considering how “sticky” this transformation will prove in the face of an array of new challenges. Date: Friday, 31 July 2015. Venue: Room 537, General Purpose North Building (#39A), St Lucia campus, The University of Queensland. Image credit: Civil Party Chim Meth appearing before the Khmer Rouge Tribunal on 9 July 2009. 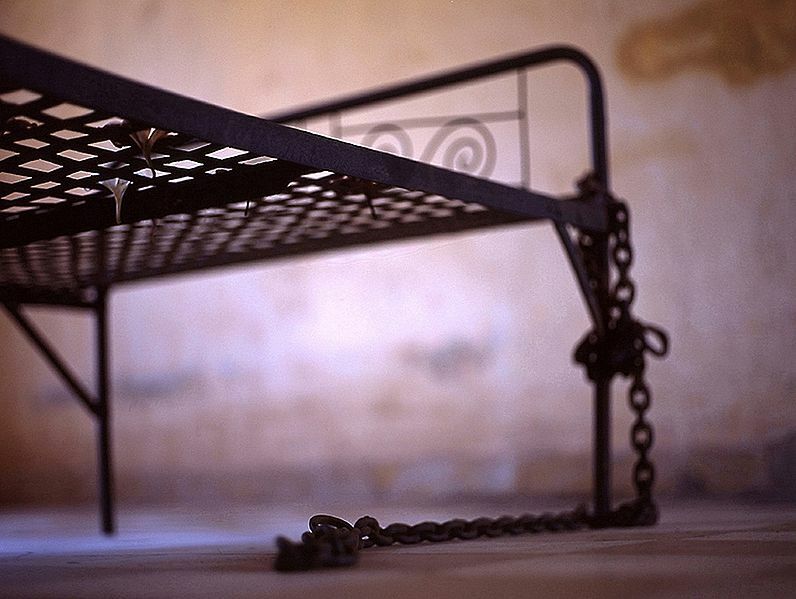 Courtesy of Extraordinary Chambers in the Courts of Cambodia. 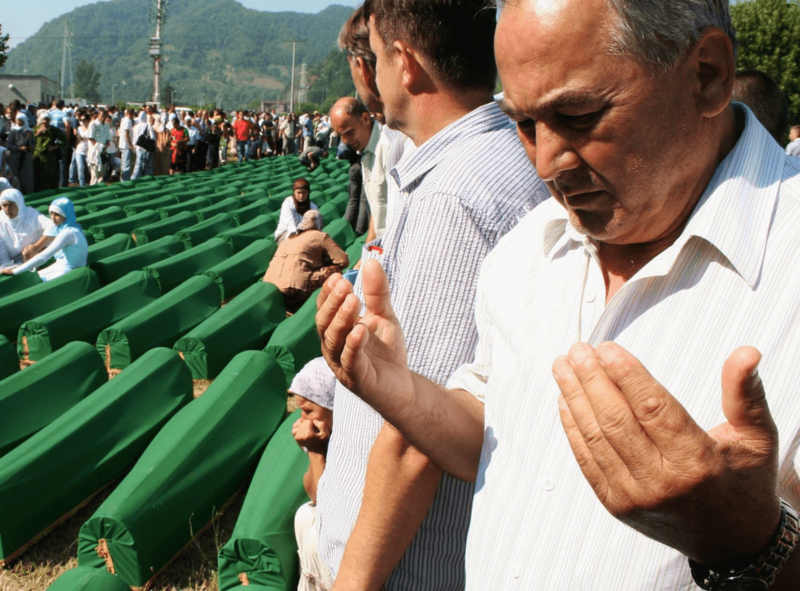 July 2015 marks 20 years since the fall of the UN-declared safe area of Srebrenica, which led to the mass murder of more than 8,000 Bosnian Muslims by Bosnian Serb troops over four days in July 1995. The massacre marked the single greatest atrocity committed in Europe since the Second World War, and has since been declared an act of genocide by the war crimes tribunal for former Yugoslavia in The Hague. The Asia Pacific Centre for the Responsibility to Protect has organized this panel to commemorate the Srebrenica genocide and pay tribute to its victims. Panellists will discuss events that led to the massacre, and lessons the UN and Member States have drawn from this tragedy to strengthen the UN’s capacity to prevent atrocities and protect civilians under threat. Date: Monday, 13 July 2015. Join US scholar Professor Denise Garcia to learn about global norms on arms within and beyond the United Nations, in the context of the regimes and global governance literatures, through the lens of ‘Humanitarian Security Regimes’. This seminar will also address the potential rise of new regimes on future weapons including unmanned aerial vehicles, lethal autonomous weapons, or ‘killer robots’, as well as the threats arising from attacks on cyberspace. 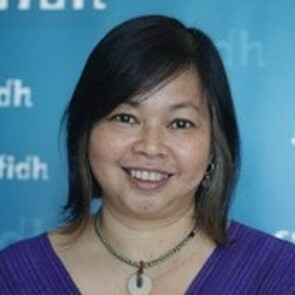 Denise Garcia is the Sadeleer Research Faculty and associate professor in the Department of Political Science and the International Affairs program at Northeastern University in Boston. She is a member of the Academic Council of the United Nations, the International Committee for Robot Arms Control, and the Global South Unit for Mediation. Date: Monday, 8 December 2014. The emergence of the concept of the Responsibility to Protect stimulates more profound debates by providing alternative perspectives and terminologies to the traditional focus on state sovereignty and the protection of human rights. China has been an important voice of dissent – or at least skepticism. 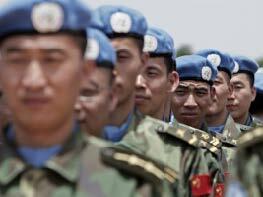 This public lecture will draw attention to debates about R2P within China. Combining in-depth interviews with senior diplomats and practitioners with a review of academic literature, this lecture will canvas the different views held by Chinese officials and scholars on the concept of R2P. How should the new norm of R2P be constructed so as to shape the concept into an international norm that is more acceptable, legitimate and operational? The lecture will be presented by Dr. Liu Tiewa, associate professor at the School of International Relations and Diplomacy at Beijing Foreign Studies University. She is also a visiting fellow at APR2P, and serves as the Centre's China Program Coordinator. Date: Tuesday, 21 October 2014. Venue: Abel Smith Lecture Theatre (Building #23), St Lucia campus, The University of Queensland. Join researchers from the School of Political Science and International Studies (The University of Queensland) and the Key Center for Ethics, Law, Justice & Governance (Griffith University) to learn what happens in societies across the globe when religion becomes a matter of political debate. From free speech and the decision to wear the veil, to the media's role in stoking anti-Islamic sentiments in Europe and Australia - come learn about what it means for women when their religion is politicised. This panel will be chaired by APR2P Director Professor Alex Bellamy. Date: Thursday, 16 October 2014. Venue: Room 234, Parnell Building (Building #7), St Lucia campus, The University of Queensland. Dr. Charles Hunt examines varied approaches to monitoring and evaluating the effects of peace operations, with particular emphasis on UNPOL in his most recent book UN Peace Operations and International Policing: Negotiating Complexity, Assessing Impact and Learning to Learn. This monograph develops a framework tested through field research in Liberia for Monitoring and Evaluation (M&E) that enables effective impact assessment. By enhancing the relationship between field-level M&E and organisational learning, this research contributes to the pursuit of more professional and effective UN peace operations. Date: Wednesday, 1 October 2014.